Ancient Roman Christianity was only founded perhaps in 4 BC (as historians predicted), the year when its founder, Jesus Christ, was born. It is a religion that insists upon doing good to others and developing in oneself qualities such as compassion, kindness, humility, gentleness, and patience. It is also important for every Christian to be able to forgive and forget. It is as we know today, is a religion that is excepted by most and widely practiced by people all over the world. It was not exactly the same case as in the past, however, especially in ancient Rome. The following is a story of how and why this was so. Forty years after the death of the Roman emperor, Augustus Caesar, the new emperor Nero came to the throne at the age of sixteen. He was a wildly extravagant leader, taxing the people heavily to support his personal projects. He was also a wicked man. In the year 64 A.D. a terrible fire raged for days in the slum districts of Rome, killing thousands of people and thousands were homeless. It is said that Nero had started the fire. It was the as cruel way to rid Rome of both the slums and their occupants. 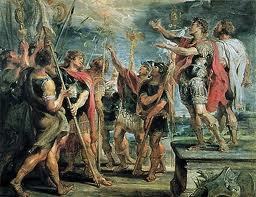 However, Nero used the young community of Christians as his scapegoats(people that made to bear the blame of others. ), saying that they had started the tragic fire. He ordered many of these Christians to be killed in -the amphitheater and elsewhere. 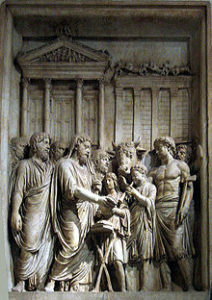 The official Roman dislike of Christianity was surprising, for the Romans were usually quick to adopt the gods of other faiths into their own religion. For instance, when Rome conquered Greece, the Romans readily accepted the Greek gods and goddesses and their myths and altered many established Roman deities to resemble their Greek counterparts. The Roman god Jupiter, for example, took on many traits of Zeus, the Greek god of the heavens. Thus, why then could they not accept Christianity?? The Romans also declared their emperors to be gods, beginning with Augustus Caesar. However, the Christians refused to take part in the worship of emperors and were as a result, so disliked by the Roman State! Christians were also seen as subversive enemies of the state in their fervent desire to make converts. 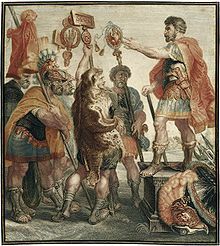 Despite the persecutions, particularly under the emperors Nero and Diocletian, the number of Christians increased and, in 313 A.D., the emperor Constantine granted the Christians freedom of religion. Thus, Ancient Roman Christianity was not well received by the Romans. The Christians refusal to follow the rules of the Romans definitely angered the Romans much. Christianity was even considered to be an illegal religion and Christians were even alleged to practice black magic and even cannibalism that is (The act or practice of eating human flesh by mankind).